Baked millet gratin casserole tastes similarly to quinoa macaroni and cheese, and a dish that is kid-friendly. 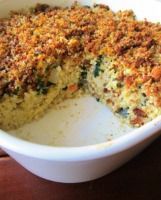 To make this millet gratin casserole gluten-free, omit the soy sauce and the breadcrumb topping. Pre-heat the oven to 375 F and lightly grease a casserole dish. I like to use a homemade olive oil spray for this. Cook the millet in water or vegetable broth just until tender, about 15 minutes. While the millet is cooking, heat the onion and garlic in olive oil for 2 to 3 minutes in a large skillet, then add the mushrooms. Heat, stirring, for another minute or two, then add chopped Swiss chard or kale and soy sauce. Cover the pan and allow to cook for just a minute or two, until greens are lightly wilted. In a large bowl, beat the egg and milk together. Combine milk and egg with millet, cooked mushrooms, onions and greens and Parmesan cheese then spread into prepared baking dish. In a separate small bowl, combine the melted butter, margarine or olive oil with the breadcrumbs, optional three tablespoons of Parmesan cheese and Italian seasonings and sprinkle evenly on top of millet in baking dish. Cover and bake in the oven for 15 minutes. Remove cover, increase heat to 425 F, and heat for another 8 to 10 minutes. To reduce the fat, use nutritional yeast and soy milk instead of regular milk, and it's still equally delicious and also dairy-free (though not vegan because of the egg).